Over at F1 Fanatic, Keith Collantine has sparked a lively debate by pointing out that Kimi Raikkonen and Felipe Massa seem to disagree about the effects of banning traction control (TC). I have had my say on the matter in an earlier post, but I find it interesting that the prime objection to the ban is that it decreases safety. And so we come to the old question of how safe we can make F1 before it becomes no more exciting than a video game, where the consequence of a mistake is a loss of time only. 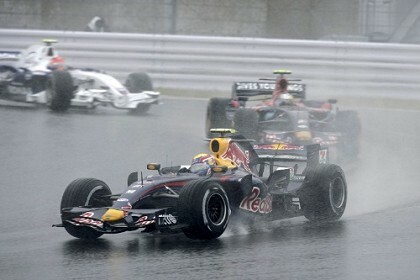 In the 2007 season we saw how the creation of large paved run-off areas has meant that a driver falling off the circuit can just drive back on again, at times even gaining an advantage from his mistake. Various suggestions have been made to ensure that off-track excursions have to be paid for in some way but this does illustrate the fact that there is a balance to be sought between safety and fair competition. It would be easy enough to make the cars so safe that injury, let alone death, becomes almost impossible. Kubica's Canadian GP accident shows just how strong the survival cell in an F1 car is these days and we could add to that by insisting on enclosed cockpits and even more front end protection (remembering that Kubica's feet were visible at the broken end of the cell after the crash). We could enclose the wheels to prevent their contact with other cars (contact between open wheels being invariably the cause of the car taking off) and add stability control to TC and other electronic driver aids. But would it still be Formula One? The sport is a compromise between two major aspects: the skill of the driver and the technical excellence of the car. When either one of these becomes too important, F1 degenerates into something else entirely. Place too much importance on the competition between drivers and you end up with a spec series; allow technology to be the deciding factor in winning races and the human interest disappears - one might as well remove the drivers and allow the technical wizards to compete for designing the best robot. Certain aspects of the cars are retained because, without them, the sport ceases to be what we know as F1. The prime example is the open wheel, without which the car becomes a sports car. Open wheels will be retained even though they are probably responsible for more accidents than any other factor, especially when we take into account the fact that they are the culprits behind the enormous amounts of spray thrown up in wet races. So we already accept that safety will always be compromised in F1; there are limits to the quest for safety beyond which we will not go. And traction control is the present battleground where we seek to define a limit, a reasonable balance between safety and competition between drivers. Let us not forget that, until recently, the F1 community was virtually unanimous in wanting to get rid of TC. The reason is obvious - TC takes away some of the responsibility of the driver to ensure that his wheels do not spin and lose traction. In other words, more skill is needed to drive without TC and it is skill that we are interested in when we watch F1. Now, suddenly, some of the drivers are expressing doubts about the wisdom of banning TC. Safety is the excuse, the likelihood of more accidents being pointed out and the difficulties of handling the car in the wet. But let us get this in perspective. TC has been in and out of the sport for over a decade now, but there was a time when the cars were more powerful and had no TC whatsoever - the turbo era. Somehow the drivers coped and nobody suggested that there would be fewer accidents if TC were to be introduced. It is not as if today's drivers were being asked to do anything that hasn't been done before, therefore, and they will do it in cars that are much more crash resistant than in the past. If safety is compromised at all, it is by such a small amount as to be negligible. Yet the balance between skill and technology will have been altered in the right direction. For years we have been complaining about technology being increasingly the deciding factor in the sport; now we have a situation where that trend has been reversed at least a little. There is even some hope that the best drivers will be able to use their talents to rise up the grid a place or two. And, make no mistake, "the best" means those who cope best without TC. Car control is what we are talking about and having the courage to floor the throttle and let the TC handle the results has nothing to do with skill. It seems to me that there is far too much fuss being made about the ban on TC. It is most likely that the fans will notice no difference at all, while the drivers will quickly adapt. In a year's time it will be a dead issue, only to raise its head once again if some clever designer finds a way to sneak it back in through some unnoticed loophole in the regulations. Safety may have been compromised but only minimally - and the benefits to the sport far outweigh any slight increase in the risk of accidents. It is possible to present anything as a positive or a negative. The current traction control coverage is an ideal example. For example it could be argued that traction control allows the driver to carry more speed in the wet so that should the car run out of grip it will do so at a higher speed and therefore have a bigger accident. To take that to extremes imagine the outcry if Bernie announced that for one race all the drivers were going to be replaced with fans. There would be enormous outrage at the risk, predictions of total carnage, huge accidents, multiple deaths etc. In reality most fans would struggle to complete a lap and would get nowhere near the limit of the cars. The result would no doubt be loads of harmless spins and cars strewn all over the track. The winner would probably be the only driver to get through the third corner. It wouldn't exactly be entertaining but it could be argued that F1 would be much safer if the drivers didn't know what they were doing. Anything can be spun in a way to make the case the speaker wants. That is certainly true, Steven, and I think that is happening in the TC debate, to some extent anyway. What really surprises me is that David Coulthard should be leading the charge against the lifting of the ban - I'd have thought that, having driven without it, he would know that it's quite within the capabilities of F1 drivers. Perhaps he is more concerned that there be some sort of limit put on wet races. Fuji was a bit of a lottery, after all. The thing that annoys me is that DC seems to have accepted that racing at Fuji was acceptable. To me racing should be abandoned when it is as wet as that. If you can't see it isn't safe. Giving Fuji a race at that time of year is another example of Bernie's bank balance being more important than driver safety. I agree that the race at Fuji should have been cancelled. But F1 just doesn't do that - the television must run on schedule. I suppose we just have to be grateful that Suzuka has been allowed back in and will alternate with Fuji. The TC ban may well seperate the men from the boys - perhaps thats why some are opposed to it? One thing I will be glad to see the back of this season is the ridiculous fuel burn stage in Q3. I know some are fed up with the quali format being messed with, but this change is a good one & hopefully will be the last. The problem with qualifying, as far as I can see, is that the more complicated they make it, the more unexpected problems arise. And the latest changes merely add to the complexity. Why they can't just go back to the beginning and have an hour of free runs to set their best time, I don't know. So they all make their runs in the last ten minutes and there's an empty track for the rest of the session? Who cares? It's still just as exciting in those last few minutes. But then, Clive, you waste at least 30 minutes of TV, and that's not good. I liked the previous KO system already, they only needed that one tweak: declare fuel loads before quali, and do quali on low-fuel. That way, we can keep that great excitement we got then, while still being practical about it. The empty track issue can easily be solved by requiring each car to put in a set number of laps per 15 minute period. The issue had to do with cars not being seen during the hour, so mandate that they will be seen, just let them run on low fuel, so we actually get the fastest driver in the best car, none of this stupid fuel strategy business. Agreed absolutely, Arnet. Whatever the details of the qualifying system chosen, the key is simplicity - make it too complicated and problems are guaranteed to appear. I'm a fan, and I'll wager I can make it to turn four! Of course I'll need a red car.